Have you ever wondered how explosively funny people from the Middle East are? 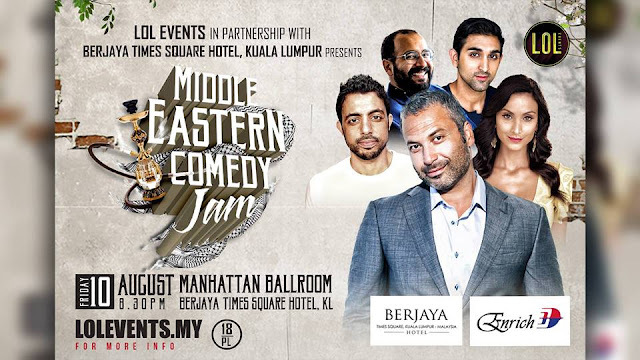 Wonder no more as LOL Events presents The Middle Eastern Comedy Jam live in Kuala Lumpur! With an aim of turning the show into a yearly aﬀair, The Middle Eastern Comedy Jam promises a fun-ﬁlled two-hour show with a mix of the most talented comedians specially curated from the region. Jokes in tow, these comedians will bring you stories from diﬀerent walks of life. It’s comedy, so why don’t you just sit back, relax, and laugh out loud. The show features Ahmed Ahmed, as seen on Netflix and Comedy Central, who will also be the host of the show, America’s Got Talent Semi Finalist Sammy Obeid, Spider Man 3’s Crystal Marie, Omid Singh- co creator of Story Poker, and Feraz Ozel, winner of the Funzine Comedy Competition. Happening on the 10th of August 2018 at 8:30pm at Manhattan Ballroom, Berjaya Times Square, ticket prices range from RM80 to RM250.